MOTORCYCLES HAVE LONG BEEN OUR PASSION AT PBC, AND THIS STEP SEEMED LIKE A LOGICAL ONE TO US. 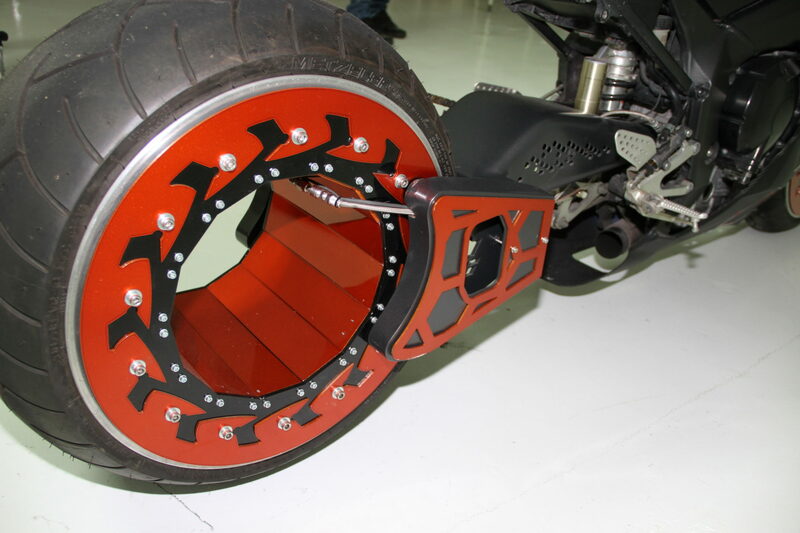 WITH THE SUCCESS OF OUR NEUTRON HUBLESS MOTORCYCLE, WE FELT THAT BRINGING THE HUBLESS WHEEL TO THE MASSES WAS ALMOST AN OBLIGATION TO SOME EXTENT. 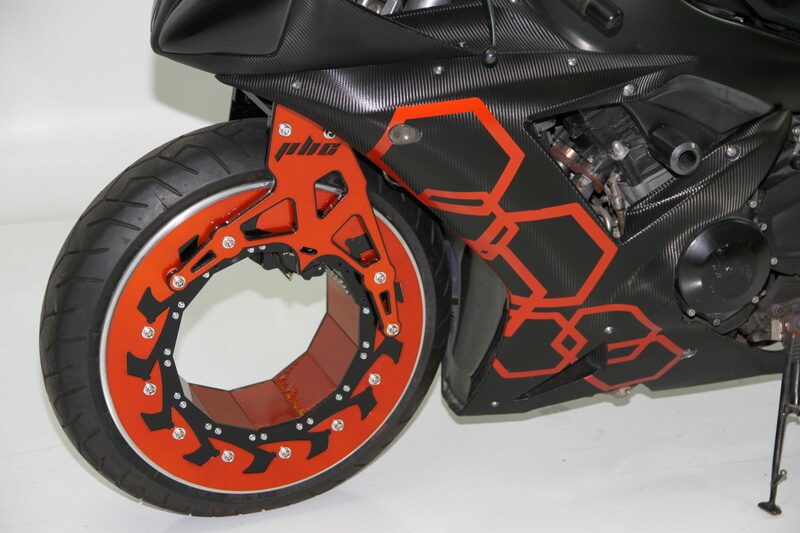 THE IDEA THAT A HUBLESS WHEEL KIT COULD BE MADE TO FIT ALMOST ANY SPORTS BIKE BUILT WOULD BE A MASSIVE UNDERTAKING, AND PBC WAS UP TO THE CHALLENGE. WITH PROTOTYPES BEING BUILT AND RIGOROUS TESTING UNDERWAY, WE TURNED TO THE DESIGN ITSELF TO TRY AND MAKE A HUBLESS WHEEL THAT STILL MAKES A STATEMENT. THAT STATEMENT WAS HEARD LOUD AND CLEAR WHEN WE FINALLY UNVEILED THE ORIGINAL HUBLESS R1 FOR ALL TO SEE. 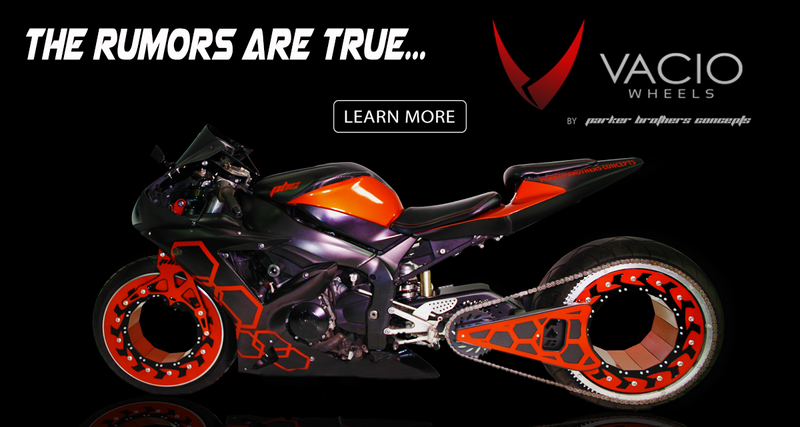 THIS CONCEPT BIKE LET US SEE THE FRUITION OF OUR LONG HOURS OF WORK, BUT IT ALSO SHOWED THE WORLD THAT SOMETHING THAT WAS THOUGHT TO BE UNDRIVEABLE, WAS WITHIN THEIR GRASP. THE NEW KITS WILL BE AVAILABLE FOR MOST SPORTS BIKES AND EVENTUALLY FOR CRUISERS AS WELL. THE KITS START AT 3550.00 FOR A REAR WHEEL KIT. THE KIT INCLUDES EVERYTHING YOU NEED TO GO FROM MILD TO WILD IN 1 DAYS TIME. THE SWINGARM IS A CUSTOM CNC MASTERPIECE THAT EASILY BOLTS IN PLACE OF YOUR FACTORY SWINGARM – NO CUTTING, NO WELDING, AND RETURNING YOUR BIKE BACK TO FACTORY IS EASY TO DO AS WELL. 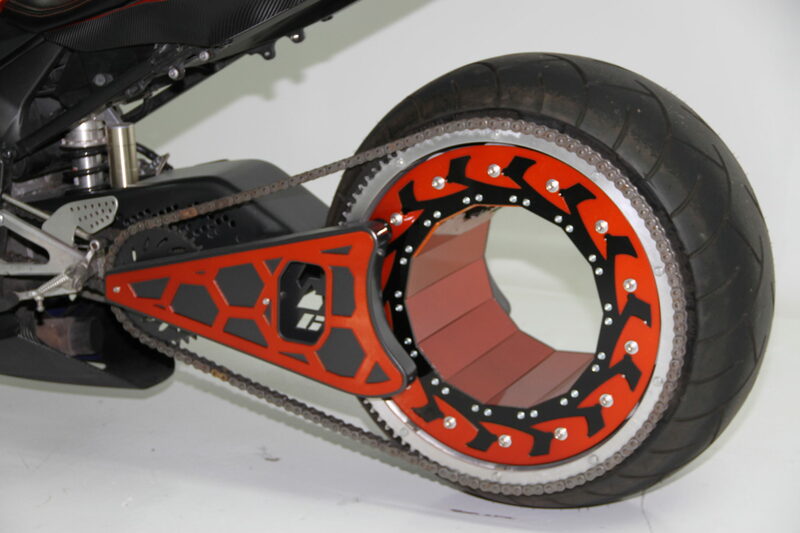 THE KITS ASLO INCLUDE THE HUBLESS WHEEL, MOUNTED TIRE AND FULL CHAIN THAT YOU WILL NEED TO COMPLETE YOUR MOTORCYCLES TRANSFORMATION. ONCE IT IS DONE, ALL YOU NEED TO DO IS RIDE BY AND WATCH THE REACTIONS. THE NEXT STEP IS UP TO YOU, CONTACT US TODAY AND FIND OUT HOW YOU CAN BE THE FIRST PERSON IN YOUR AREA TO OWN THIS ONE OF A KIND KIT. FILL OUT THE FORM BELOW AND LET’S GET ROLLING!!! PICK THE KIT THAT SUITS YOU BEST - THEN LET'S GET ROLLING - PLEASE NOTE *FRONT END KITS ARE IN DEVELOPMENT AND WILL BE AVAILABLE SOON - PLEASE LET US KNOW IF YOU ARE INTERESTED IN A FRONT END KIT AS WELL. THE STANDARD ENTRY LEVEL REAR WHEEL KIT WILL HAVE YOU RIDING IN STYLE IN NO TIME AT ALL. 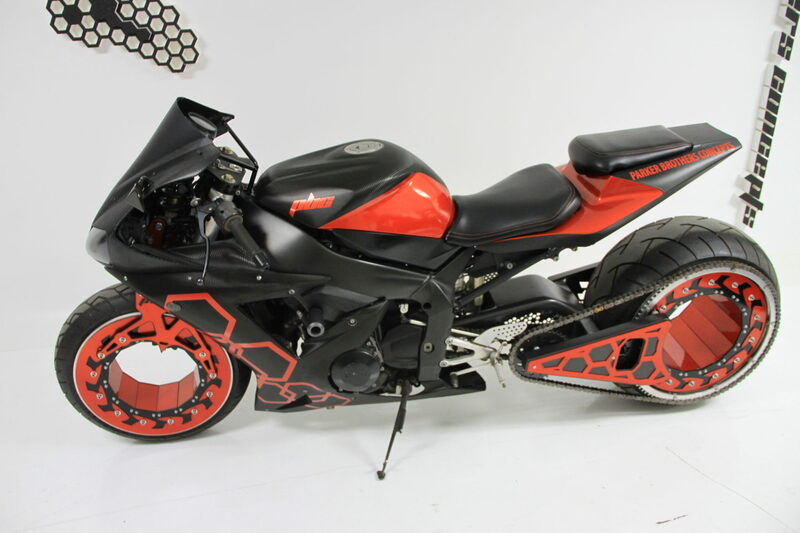 AVAILABLE FOR MOST STANDARD SPORTS BIKES, THE KIT COMES WITH A CUSTOM SWINGARM, HUBLESS WHEEL WITH MOUNTED TIRE, CHAIN, AND EVERYTHING YOU NEED TO GO HUBLESS. THE 280MM REAR WHEEL KIT WILL HAVE YOU RIDING IN STYLE IN NO TIME AT ALL. 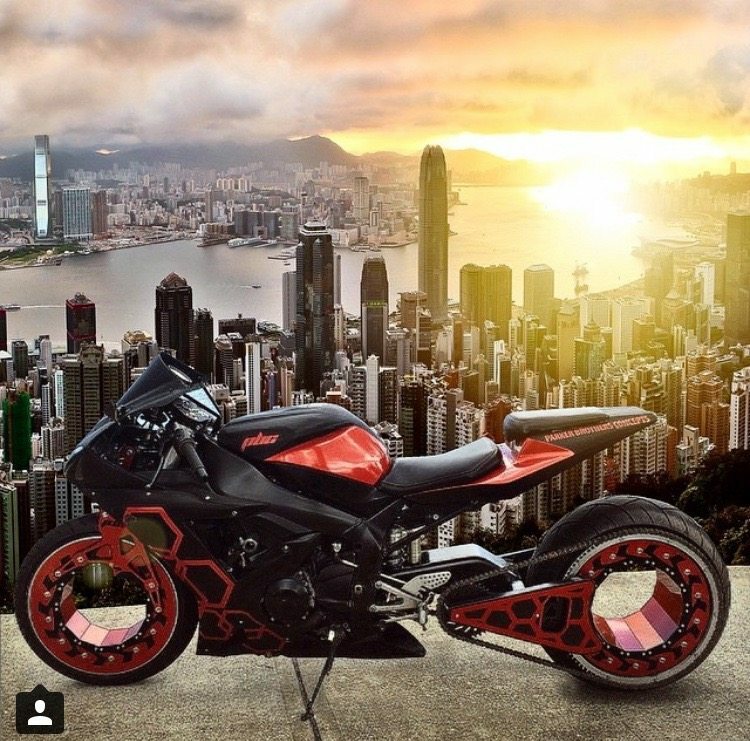 AVAILABLE FOR MOST STANDARD SPORTS BIKES, THE KIT COMES WITH A CUSTOM SWINGARM, HUBLESS WHEEL WITH MOUNTED TIRE, CHAIN, AND EVERYTHING YOU NEED TO GO HUBLESS IN LESS THAN A DAY. THE 300MM REAR WHEEL KIT WILL HAVE YOU RIDING IN STYLE IN NO TIME AT ALL. 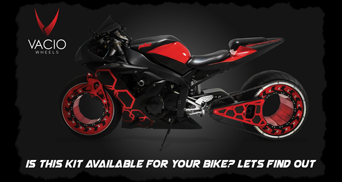 AVAILABLE FOR MOST STANDARD SPORTS BIKES, THE KIT COMES WITH A CUSTOM SWINGARM, HUBLESS WHEEL WITH MOUNTED TIRE, CHAIN, AND EVERYTHING YOU NEED TO GO HUBLESS IN LESS THAN A DAY. THE 330-360 REAR WHEEL KIT WILL HAVE YOU RIDING IN STYLE IN NO TIME AT ALL. AVAILABLE FOR MOST STANDARD SPORTS BIKES, THE KIT COMES WITH A CUSTOM SWINGARM, HUBLESS WHEEL WITH MOUNTED TIRE, CHAIN, AND EVERYTHING YOU NEED TO GO HUBLESS IN LESS THAN A DAY. WHAT YEAR, MAKE AND MODEL IS YOUR RIDE? WHAT TIRE WIDTH ARE YOU LOOKING FOR? 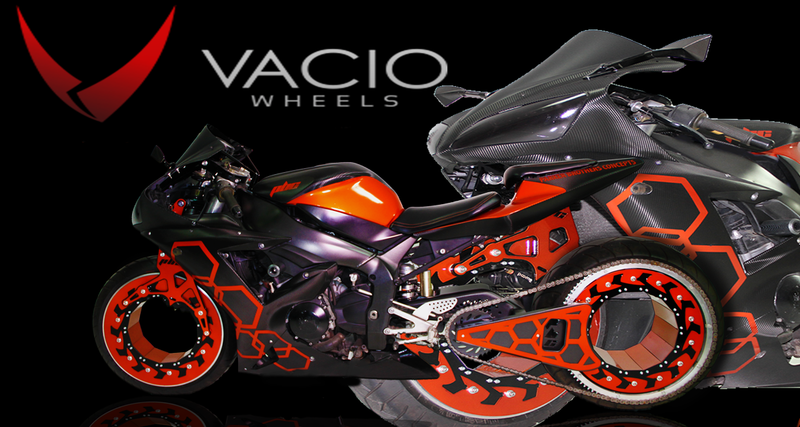 THERE IS PROBABLY A VACIO KIT THAT IS RIGHT FOR YOU. READY TO PURCHASE? 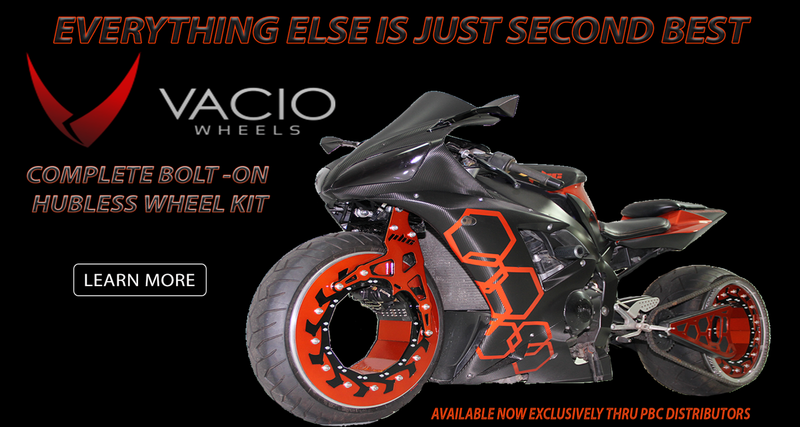 We just need a bit more information to build your new Vacio wheel kit, email us with your specific year, make and model and we will get you additional information and payment options to get you rolling on a Vacio Hubless wheel kit NOW. Even if you just need more information, drop us a line here and let us answer all your questions. We look forward to helping to make your hubless ride a reality. Live your dream today.